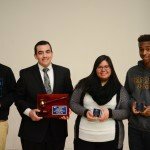 Nominate Your Seniors for National Urban Debater of the Year by Friday! The Urban Debater of the Year application is now open. What is the Debater of the Year? The Urban Debater of the Year recognizes a debater who demonstrates commitment and dedication to debate, improvement in their performance in school and debate, academic excellence and leadership in their school, urban debate league and community.What is Awarded? Finalists will each receive college scholarships of at least $1000.The Urban Debater of the Year will receive a college scholarship of at least $2000. Additionally, the Urban Debater of the Year and their partner will automatically qualify to compete in the Urban Debate National Championship and will deliver the keynote speech at the Annual Dinner. You can follow in the footsteps of current University of Kentucky student and former Northside College Prep debater Maria Sanchez, the 2016 Debater of the Year! https://resources.chicagodebates.org/wp-content/uploads/2019/02/Georgetown.jpg 800 1880 David Song https://resources.chicagodebates.org/wp-content/uploads/2018/08/blue-logo-resource-1-300x164.png David Song2019-02-06 23:14:332019-02-23 15:58:44Nominate Your Seniors for National Urban Debater of the Year by Friday!